There's perhaps no greater comfort than the unwavering affection of a creature whose very instinct is to love. And for JJ the dog, love is part of her life's work. The sweet pup is a certified therapy dog with Project Canine, a group committed to connecting canines with people who stand to benefit from their soothing presence the most. JJ's specialty involves working with patients in hospice care, helping to guide people through the emotionally trying final stages of life. "This woman came to us from the hospital and was actively dying, as many who come to us are. She was one of those people who didn't have family; Some people just don't. But JJ stayed with her," said Calhoun. "You can actually see her moving her fingers to pet JJ's face. That was the first time she had moved all day." 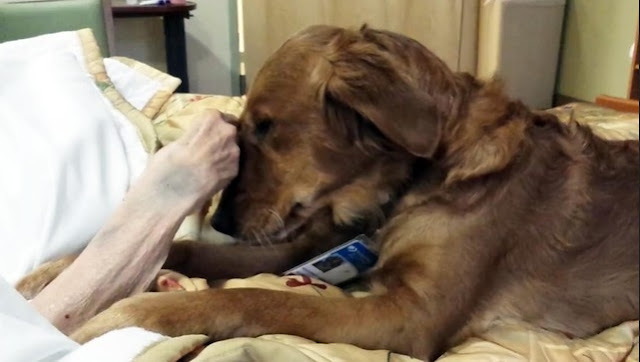 Responses to "Therapy Dog Sweetly Assures Dying Patient She's Not Alone"